I got a call from WolfRunner. She needed to run 12 miles as training for her half marathon and wanted a running buddy. Preferably one who didn’t talk all the time, didn’t get lost and could run 12 miles. However, she couldn’t find anyone. So she decided that she could run with earplugs and rely on GPS and she gritted her teeth and gave me a call. 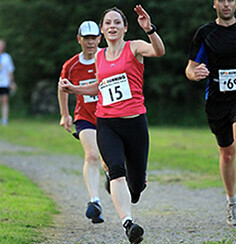 This run was 2 weeks before her very first half marathon and was to be her longest run – ever! - so we decided that rather than running this at a particular pace it was more important to get the mileage in and get her used to being on her feet for over 2 hours. I had a nice route that I used to run last summer before the paths got too overgrown and thought that this might be a good one. It’s round about 12 miles and as we’re still about 2 months away from thistle and stinging nettle season we might get away without too many stings or prickles. Last time I’d tried to run this route in the height of summer I ended up with bright red legs – so stung from nettles and scratched by thistles it looked as though I was wearing a thick pair of red stockings. Ouch. It’s nice to have company on the run and WolfRunner is always a sight to behold in the brightest running gear she can find. I feel positively out-neoned. In fact I get neon-envy. And today she had new pink and purple sparkly trainers. Trainer envy too. She also promised that the irritating computer woman was no more (see here). Deal. As we were running up the first section which is a nice smooth disused railway track, I tell WolfRunner that the later parts of the run might be a tad overgrown. No problems, she said with casual confidence. I’ve done The Wolf Run. Somehow she even managed to enunciate the capitals. With perfect comic timing we turn the corner and find our way barred by a 5ft pile of trees and branches. I turn to Wolf Runner who shrugs and starts climbing. Good girl. She didn’t even complain about her new trainers. We made it over the pile of branches to find that our footpath was in the process of being changed and that a bridge had been unburied. Quite a feat of Victorian engineering had been lying underground and now rose about 30 feet in the air, red brick arches curving above the trees. Previously it had been a mound of earth with a footpath zigzagging it’s way to the road at the top. Wow. I couldn’t remember which bridge to take the footpath from but a lucky chance meant that I’d picked the right one and we ran through a field with horses fenced off on either side looking on curiously as two brightly coloured people ran past them. We turned right into a field with a footpath sign nailed to the gatepost. Checked with WolfRunner that she wasn’t scared of horses. No? Good. I warned her that the horses in this field were a bit ... friendly and that if they saw you they would try and play with you in a bouncy, ‘running over you’ way. And maybe eat you. She asked me whether I was scared that I couldn’t outrun the horses. I reassured her that I didn’t need to outrun them. I just had to outrun HER and hope she distracted the horses enough to give me time to get to the next gate. We got to the next field un-galloped on and without any horse drool on us. Luckily they didn’t spot us until we had already crossed the river (see – told you it was cross country) and my howl of pain as WolfRunner jumped it to land on my foot alerted them to the fact there were interlopers in their field. By the time they started galloping towards us we had already sprinted through the gate. WolfRunner wanted to stop and admire them, but I warned her that horses did in fact like to eat humans and My Little Ponies were a marketing ploy BY the horses to get little girls to trust them. The next field was fun to run in. It had long grass and tussocks but it was more like trail running – the fun kind. The only thing you had to watch out for were the long creeping lengths of brambles which were hidden under the grass like tripwires. Also the occasional rabbit hole. The run through the field was like a more rural version of an Indiana Jones adventure but without cool hat, darts and golden idol. And instead of pits of spikes it was rabbit holes tangled in brambles. Winding between the tall hedges and between banks into a dark tunnel, black and cool after the evening sunshine. Out the other side into the light and through a gap in the hedge into a ploughed field where the young plants were 3 inches tall. The farmer had left a small margin at the side of the field to allow for the footpath and we followed this. One foot awkwardly in the ditch and one on the rutted field. I passed a small bleached skull unearthed by the plough with some remaining pointed teeth attached. Maybe a fox. Or an insanely large rat. Through the field and into the next with deeper ruts ... and a fallen tree which stretched over the footpath. It was an oak. An old huge oak stretching out towards the centre of the field. I could get my leg onto it but couldn’t get any leverage or purchase with my fingers on the bark. Ok. Time to go around then. Finally managed to get leg off tree. Not as bendy as I’d thought. Following the rutted earth along the edge of the field and as we came towards the woods a grouse darted out of them and into our path for a moment, running along absurdly upright like a small brown Jemima Puddleduck. I have no trouble finding the kissing gate into the field ... but I have never found the gate out of it again. I always end up climbing over the 5 bar wooden gate in the corner praying that I don’t get a splinter or snag my lycra and have to run 6 miles home with a draught in an embarrassing place. Made it over the gale, running gear thankfully un-holed and fingers unsplintered and we came out of the large gateway lined with daffodils and Spring flowers and onto a busy road. A large black Mercedes pulled up alongside us, but rather than making an indecent proposal to 2 ladies clad in skintight - albeit neon – lycra, the driver wanted to find out how to get to Coventry. Phew. No need to beat off weirdos armed only with gel packs and ipods today then. 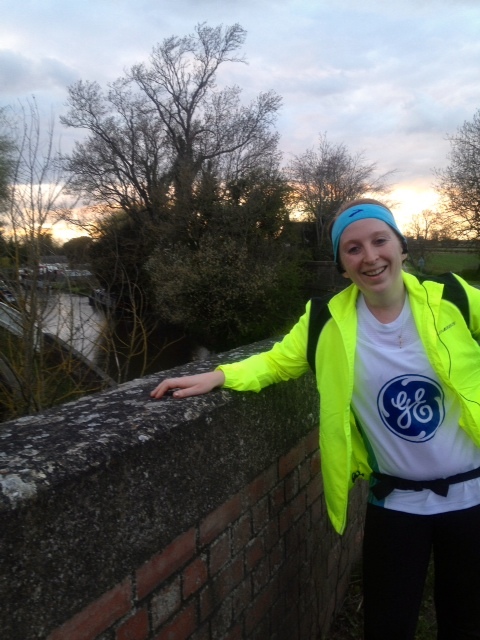 We had a long downhill through a pretty village and WolfRunner got to try her first gel ever. Judging by the expression it wasn’t quite what she had expected. C’mon Buttercup, if you wanted it’s not about the taste but the result! However revolting she found the taste, she was happy with the result when a little while later she seemed to find her turbo button and increased her speed. Past the last corner of the village and a wooden signpost and back into lanes bordered by hedges, the light was dimming to blue now and dusk had set in. Every field we passed seem to have a token pheasant in it as if someone had set them there in ‘The Perfect English Countryside’ scene. I was expecting a talking scarecrow any minute. WolfRunner almost threw a wobbly when I asked her whether I’d mentioned the ford. She looked down at her sparkly new trainers, their bright pinks and purples dimmed slightly from the tree climbing, ploughed fields and gate climbing and hesitated. She sighed and seemed to reach a conclusion. “Ford? No problem”. The ford was dry and we were able to cross without even our toes getting wet. I was a bit disappointed. I’d promised WolfRunner a proper cross country run. (sigh) Never mind. Maybe I could push her in a puddle later on. We followed one of the back lanes through the pretty village of Harborough Magna and passed the church and the tiny cottages and came out opposite the pub. We both looked longingly at it, but we wanted to get 12 miles done tonight. 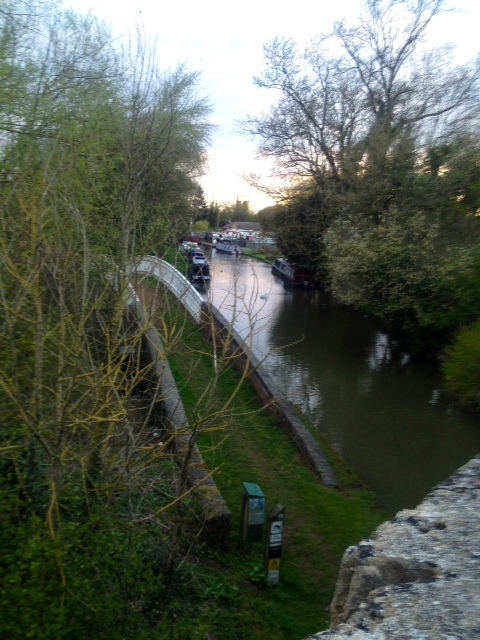 Doing 8 miles – stopping for a pint – and then doing the remaining 4 seemed cheating somehow. A half a mile run on the main road with the occasional hop onto the verge when a car passed and we paused on the brow of the hill to drop down onto the canal path below and run to the Newbold Tunnel. Now this tunnel is an odd one. No-one really minds going through it once. But once you’ve run or walked through it, you don’t want to do it again. It’s very odd. You get an aversion to it. WolfRunner agreed. We ran to the tunnel and up over the hill. We came out on a field and crossed the main road and down the hill into Newbold. 9 miles into her longest run and WolfRunner is still smiling! Now decisions ... do we head left at the Crown and jump back onto the canal path? Straight on and get home quickly or do we add a bit on and go right. Poor WolfRunner didn’t get a choice. I’d promised her 12 miles. We turned right and came out on the bypass. Not the most scenic route but the pavements are smooth and easy to run on. Now on the home straight. To the roundabout, to Tesco. Up the hill, along the canal path and home? No … not quite. We were half a mile short. WolfRunner looked longingly at the road she knew led to my house and her car but we pushed on and did a lap along the canal path, through the woods, out and through the houses. Down the final hill ... to the corner. Where she stopped dead. “My watch says 12 miles now.” She said and refused to run another step.